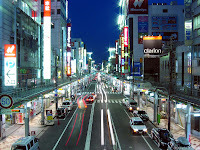 A former pleasure district, Dotonbori is famous for its surrounding theatres, shops, and restaurants and the many colorful neon. 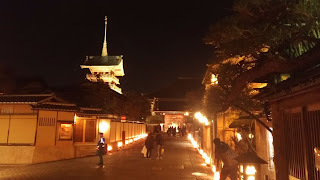 While Dotonbori is packed with interesting billboards and buildings, there are three main landmarks. These are all so funny! 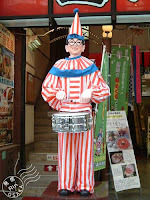 -The mechanical drum-playing clown "Kuidaore Ningyo"
-Giant moving crab billboard "Kani Doraku Crab"
-The giant athlete is a symbol of Glico candy "Glico Man"
Tenjinbashi-suji stretches from the road approaching the Tenman-gu shrine and continues for 2.6km going north to south. It has all types of stores including commodities, clothing and catering outlets on both sides of the arcade. 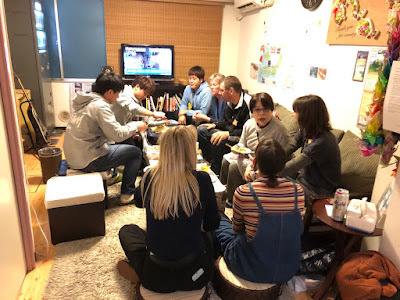 You might see and talk a friendly Osaka-no-Obachan (Middle aged housewife women who are outspoken, nosy but humane). Nippombashi Den Den Town is a shopping district in the Nipponbashi, famous for its wide variety of electronics stores, and especially famous for its negotiable prices. Why don't you try saying "Mo-chotto Makete" meaning "discount a bit, please". Here could be the best area for getting hold of anime, manga and related figures. There are a huge number of stores providing a large amount of goodies for fans of anime or manga. North-south Mido-suji and east-west Nagahori-dori Street. At the intersection, world-famous brand direct operated shops are lined up: Chanel, Cartier, Louis Vuitton, etc. 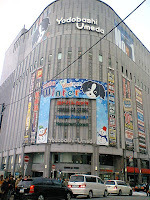 In addition to these shops, there are lots of brand shops in department stores such as Daimaru Shinsaibashi Store and Shinsaibashi Sogo. 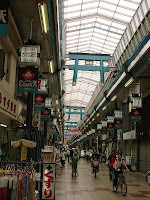 It's located at the west side of Mido-suji, This area is lined with used clothing and imported goods stores. You can feel artistic and energetic atmosphere of fashionable youth. The mega-size electronics shop with all kinds of appliances located in the north of JR Osaka station. There is a floor for fashion stores, a restaurant floor offering Japanese, Chinese, Western, and others. 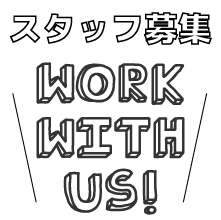 Some staff can speak English. This is a commercial and amusement complex with a huge red Ferris wheel, where you can find easily right in front of Osaka station. It's a wide variety of shops,153 in all, including GAP, SNOOPY TOWN SHOP, and DISNEY STORE. 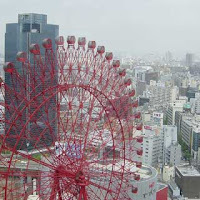 The Ferris wheel will lift you 106 meters above the ground. You can enjoy a panoramic view of the entire city!